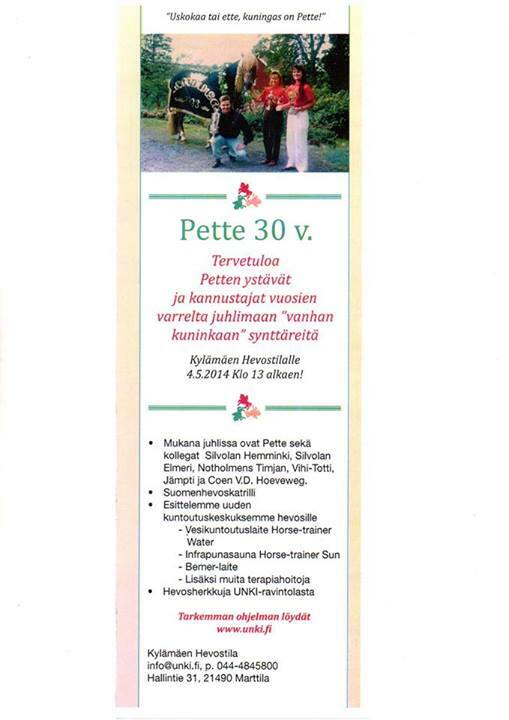 Pette was born on May 13th, 1984 at Ypäjä. He made a great career in racing. He won the Trotter King title as well as the Nordic Championship for coldblood trotters TWICE in 1993 and 1994. These are just a few merits on his list. Altogether his career included 163 races with winnings over 200 000 euro. He retired from the race tracks in 1997. Being an active horse, he didn’t settle for just resting in his retirement days. His owners decided to introduce him to riding, and started schooling him for dressage and jumping. Pette was inspected for J (Juoksija, trotter) studbook with first prize in 1995 and for R (Ratsu, riding horse) studbook without a prize in 2004. He has sired 112 foals to date, and is standing at stud this year as well. Here’s a beautiful short document of Pette, made by Ville Virtanen in 2013 (in Finnish). Categories: Breeding & pedigrees, Harness racing, Riding, Video | Tags: finnhorse, Pette, suomenhevonen, video | Permalink.